Thursday was awesome! Thursday started out with about 15 minutes of longeing in the chambon and surcingle, and he was forward and soft and lifting his back and all good things. Then I tacked him up in the ring and we rode and zoooooooooom pony. I had a forward, sensitive horse with a warmed up back who had a few glorious strides of a higher self=carriage than he’s yet achieved. I tested the waters with some shoulder-in and haunches-in and it quickly became apparent that wasn’t the ride I had to do. Instead, we worked on half-halts and using them to collect, not kill the motor. We did leg yields one step at a time, half-halting on the straight parts, and rode every step of the shoulders through circles. We finished with just a few circles at the canter, and he was more maneuverable and balanced than he’s been in months. Whooooo! I’m not thrilled he had two weeks of just free-longeing but they actually seemed to have done him some good both mentally and physically. I think we’ve finally reached a tipping point for his muscle development, in that we’re layering good on top of good and now that there’s definition it will only increase. My hand was pretty much fine; right now it only hurts if I bump the cut or make a tight fist. Just a little while longer and it will be all healed. Even better: HOUSTON, WE HAVE SHEDDING! Then, there was Friday. Friday was an insane sprint at work from start to finish and I was so much in the zone that as soon as breathing space appeared, I packed up, changed into barn clothes, and headed to the barn, only a little bit later than I’d hoped for. Then I stepped outside my car, sniffed the air, and realized crap, it’s really cold. Checked my phone: yep, 8 degrees. No riding for me. So I thought: I’ll make the most of it! I did Tristan’s topline exercises, did carrot stretches, fussed over him generally, and then started to get excited about the prospect of a quiet night of getting home early and maybe watching a movie and getting to bed at a reasonable hour, something that hadn’t happened in two weeks. And then I swore a lot and pounded the steering wheel, and tried to back out: no dice. I got out front and walked around the car and attempted to dig the wheel out, then back out: no dice. Working student arrived over the hill to grain and tried to help me push it out: no dice. Kindly farmer stopped and saw us struggling, helped dig the wheel out and helped push…well, you get the idea. I had popped just enough off the road that the undercarriage of the car was beached on the snowbank and the right wheel was in mid-air over the drainage ditch. So I called AAA, grabbed a book, went in to give Tristan more kisses, and sat in the tack room practically on top of the heater. An hour later, the tow truck arrived and hauled it out, and an hour after that, I was home in my pajamas eating pizza. Sigh. I have had so many narrow misses with snowbanks in my life it seemed time! At least I was near a warm place and have AAA. I've limited to getting stuck only in my driveway so far this winter, but it's been a weekly process every time it snows, so I feel your pain! Ooops! Glad you had AAA! Ugh. Feel for you! My boyfriend's truck is currently stuck in my yard…sigh. 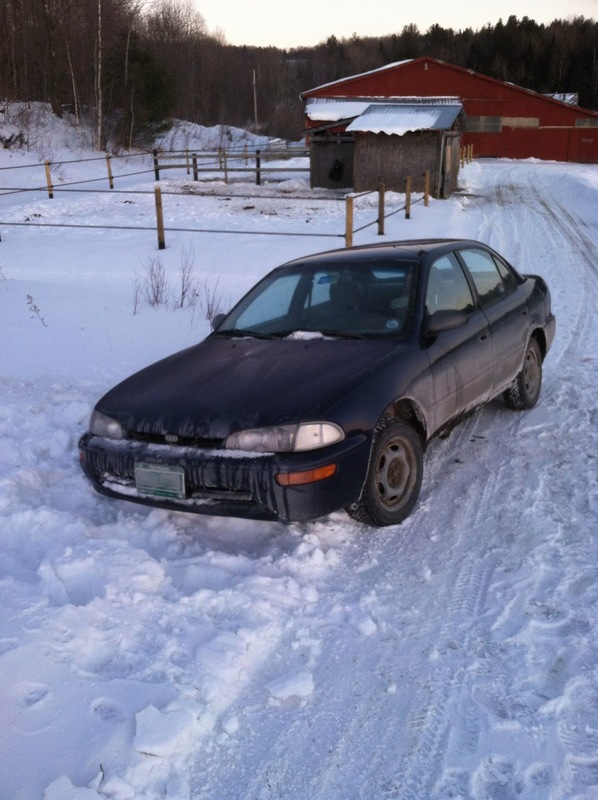 His truck won't kick into 4WD and I live in the middle of a field….in a barn….so yeah. Completely feel for you. Also…jonesing for some pizza now haha. This is the first time I've gotten stuck in a loooooong time, so perhaps I was due! My truck has not moved from the driveway in 4 months, but that was always the plan: it lies dormant during the winter. It's a gift from my parents every Christmas, and it has absolutely paid off more than once. My truck has been in my driveway for months, but it's a 2WD so that was the plan! Is the 4WD stuck or malfunctioning in some way? I am pretty much always craving pizza this winter. My body is desperate for carbs.